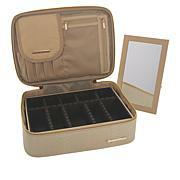 Keep all your makeup and accessories organized with style. 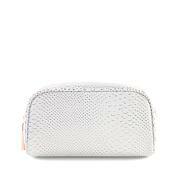 Made with beautiful snakeskin-pattern material and with compartments to organize brushes and more, this carry-all case is the perfect solution to having everything in one convenient spot. I purchased in white with gold hardware! I wanted a similar designer bag but could not justify the expense! This bag is well made is a fantastic size and an affordable price!